We went into town for a little celebration of our fellow country's independence day. While it was the best Mexican food we've had since we moved to Hawaii, it was a little pricey. Thank goodness the place made up for the ding in our wallet by providing some entertainment. For one, those are urinals in the next picture. Um....huh? Melissa didn't believe Matt when he told her, so she went in to see for herself. 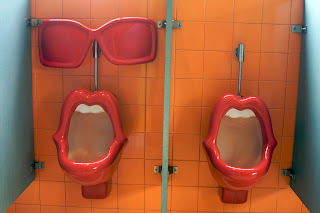 Maybe it's weird to take a picture of urinals, but those were too crazy not to record. 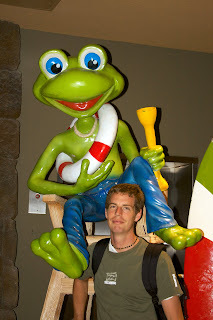 Plus, the bar seats were great fun, and the different frogs around were very friendly. 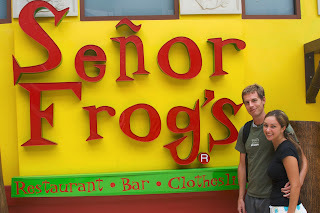 Gracias, Senor Frogs. Mmmm....nothing like eating in a thong (and I'm talking about you Matthew) at Senior Frog's!